Administrators control the lunch groups. This area has the option to add new groups or edit existing ones. One of the neat features in this section is the ability to change a lot of users group assignments at one time. 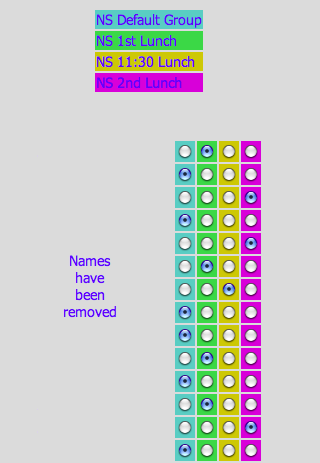 In the Mass Group Edit section, a list of users is displayed beside rows of colored boxes. The boxes correspond to group. This is useful for new school years when many teachers get new schedules and eat at different times.